This is basically an adventure sports park. Spread out over 80 hectares of forests, and only 10 minutes from Beziers, the main attraction here is the treetop adventure – where you move from treetop-to-treetop like a monkey on cables. There are about nice courses of increasing difficulty, and which means visitors of all ages and fitness levels get one kind of course or another. Paintball (separate rates and hours – check attraction website). Canyoning (separate rates and hours and location – check attraction website). A free mini-farm very close to the park. In July and August, the park also offers night programmes. Between 7:30pm-11pm, they throw in pizza with your night adventures on the treetops. Listen carefully to and follow all the safety instructions. Check attraction website for individual activity prices. Opening and closing times vary wildly from day to day and month to month. Check the attraction website to see if it is open on the specific day and time you want to go. How popular is Beziers Adventure? 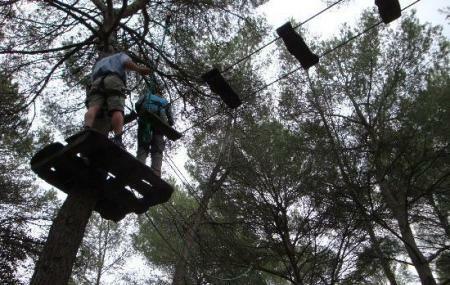 People normally club together Cactus Park and Plateau Des Poetes while planning their visit to Beziers Adventure. This is the 3rd summer that we have taken our 11 1/2 year old grandson there and he absolutely LOVES it! They have added another circuit for very young children which looks great. All the staff are so nice and helpful. We take a picnic and sit under the trees. We recommend it very highly! Brilliant day out for all the family. Adventures through the trees and lots of zip lines. Equipment and emphasis on safety is top notch. Would highly recommend. Good place, but doesn't accept payment cards! It was like stepping back into the 1980's! Perfect place to entertain the children. Great tree top courses and brilliant staff! Tree course and paintball. Owners are really nice and speak some English.